SUMOSPIN CART FOR MOVING GSA CONTAINERS - MBA USA, Inc.
Like most good ideas, the SumoSpin cart came from a need. With GSA containers weighing in at 600+ pounds empty and 1200+ pounds full, safety is always a factor, especially when the normal method is using a handcart or dolly that requires balancing the weight during the move. Further complicating movement is that GSA containers are often stored in tight spaces. SumoSpin is an answer to both of these issues. No longer required to balance the weight, the SumoSpin cart takes the full weight of the container and holds it securely and close to the ground where tipping is virtually impossible. With its patent pending design it maneuvers tight spaces with ease! Our Patent Pending design is manufactured in the USA in the State of Maryland. With its baseplate resting below the wheel axles and just inches above the floor, the low center of gravity makes tipping a virtual impossibility. Handcarts by design require a balancing of the weight of what is being carried. This requires great strength by the person or persons doing the moving. In contrast the Sumospin cart distributes the full weight of each security container onto its baseplate with its low center of gravity, and allows easy maneuverability with little effort. Three wheel design allows for a zero turning radius making maneuvering tight places a snap. Handle is removable and dual positioning to allow for varying move circumstances. From the 3/8" steel used in our baseplates to the large, sturdy wheels chosen for their weight bearing capacity, the SumoSpin cart is all about strength. To accomodate containers of 1200 plus pounds, it has to be. When moving heavy objects having them as close to the ground as possible made sense to us. That is why the SumoSpin cart is just inches off the ground, taking the worry of a fall virtually out of the picture. Click here to see a demo video. 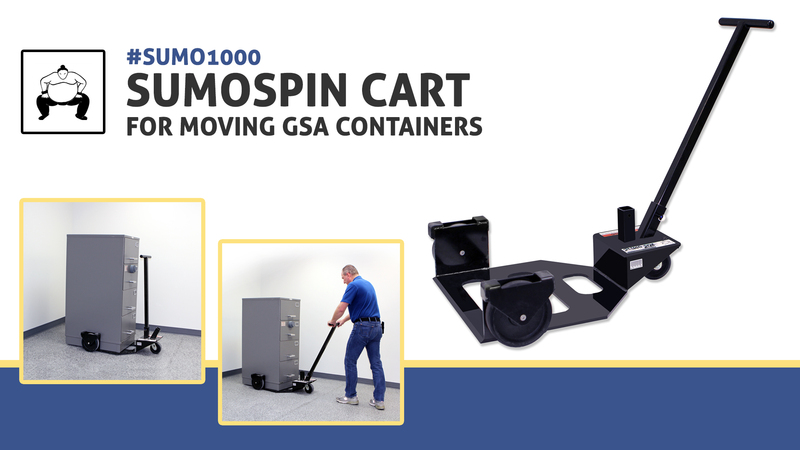 Click the button below to add the SUMOSPIN CART FOR MOVING GSA CONTAINERS to your wish list.